This practical coursebook introduces all the basics of semantics in a simple, step-by-step fashion. Each unit includes short sections of explanation with examples, followed by stimulating practice exercises to complete in the book. Feedback and comment sections follow each exercise to enable students to monitor their progress. 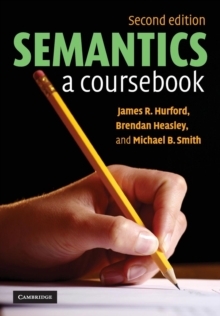 No previous background in semantics is assumed, as students begin by discovering the value and fascination of the subject and then move through all key topics in the field, including sense and reference, simple logic, word meaning and interpersonal meaning. New study guides and exercises have been added to the end of each unit to help reinforce and test learning. A completely new unit on non-literal language and metaphor, plus updates throughout the text significantly expand the scope of the original edition to bring it up-to-date with modern teaching of semantics for introductory courses in linguistics as well as intermediate students.